Alan Turing tried as best he could to make a joke of the criminal trial (see previous Scrapbook page). He talked openly about it in the computing laboratory, refusing to show any shame or remorse, or to see the law as anything but an absurdity. He continued to develop the theory of morphogenesis, as if nothing had happened. He defied the injurious and humiliating effect of the hormones on his body. The drug was probably stilbestrol. He can hardly have missed the irony that he was the object of an experiment in biological growth at the same time as being the pioneer of new biological theory. A Manchester Museum exhibition in 2012 drew on this connection. Here is a page of his base-32 machine-code programming of Morphogenesis theory simulation, reduced to half-size. He found it perfectly simple to work in base-32, using symbols from the teleprinter tape that had dominated the Tunny work at Bletchley Park. Others did not find it so easy. The letters U, U2, V, UV, at the lower right-hand corner refer to variables U and V (the concentrations of two chemicals) in the non-linear equations of the morphogenetic theory. The name of his programme is Ibsen5 (after the Norwegian playwright). There is a story to this: he used Norwegian names after his holiday in Norway in summer 1952. This was consistent with his way of talking in the laboratory, open about young men he took a liking to. Defiant again: he could not break British law but he wouldn't let that stop him. He could go abroad. He had already explored Paris, but now he was attracted to Scandinavia on hearing rumours of its dances 'for men only'. 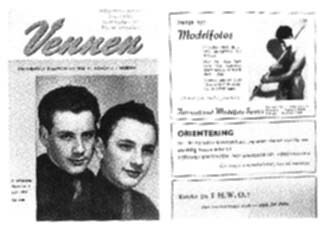 On 23 June 1948 a modern gay organisation, F-48, had been founded in Denmark and it had since branched into Norway and Sweden. There had been pictures in the press of dances in Copenhagen. His holiday was not completely disappointing. Some of his models and programs were named after the young Norwegian man he met: Kjell Carlson, probably from Bergen. These numbers are to be found in the leaf spirals of many plants. This fact was well known and famously described by D'Arcy Thompson On Growth and Form (1917). 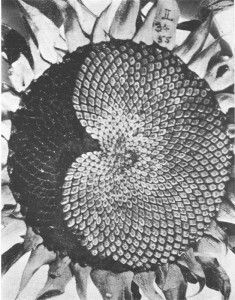 The fircone gives an easy way of seeing the spirals, and so do the centres of large flowers like sunflowers and daisies. He hoped to find an explanation of why the Fibonacci numbers would arise. One of his pieces of work was headed 'Outline of the Development of the Daisy'. In his early life Alan Turing had been sketched watching the daisies grow. The Manchester setting, with his post secured despite the conviction, gave the prospect for starting a research group in the modern sense, with graduate students joining in research and publications. Bernard Richards and Nick Hoskin were serious students working on branches of his theory. See Bernard Richards in a 2012 news article. He lost his boyfriend, Neville Johnson, as a result of the arrest. But he made more of his friends, and found some new ones, instead. He lived alone in Wilmslow, which sometimes worried those friends, but he seemed to like it that way. Robin Gandy (1919-1995) has already appeared in the 1944 Scrapbook page. After 1948 he was both Alan's research student in logic and an intimate friend. He has generously left his personal letters and these show the depth of intimacy, although he was very full of his own doings and problems, and may not always have listened to everything Alan said. Those letters were signed 'Love, Robin', not typical for a graduate student reporting to a supervisor, but he was not a lover. Alan did ask him, once, but Robin said 'Oh, Alan, that's not really my cup of tea.' He had a more sophisticated manner than Alan, making a vivid impression with his motor bike and leather jacket, and portrayed himself as bisexual. 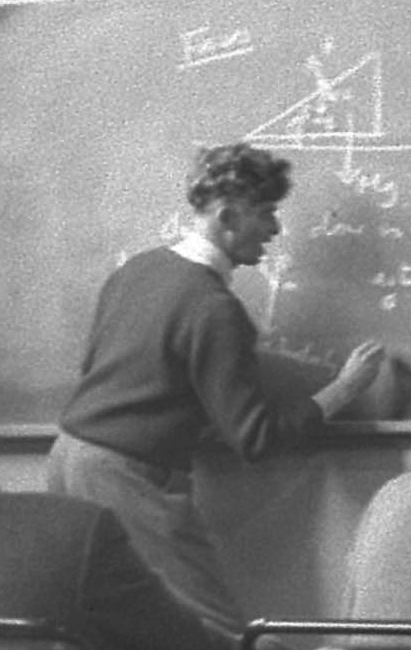 The picture shows him at work at the University of Leeds, in 1958, lecturing on Mechanics for a first-year Physics class. (David Motkin). Later he became a distinguished logician at Oxford. He more than anyone else perpetuated Alan Turing's legacy, not only in mathematical logic, but in his manner and mode of speech. P. N. (Nick) Furbank (1920-2014) was even shyer than Alan. He was on the way to becoming a major literary writer and critic, best known for his biography of E. M. Forster. They did sleep together at some point but were friends rather than lovers. This is a revealing obituary in 2014, with another here. He wrote: I was a friend of his and found him an extraordinarily attractive companion. . .
'Scandal' was the prep-school word that Routledge was obliged to use, when writing about Alan in 1960, to allude to the special internal world of King's College and Bloomsbury Group culture. It was the moral world of Keynes and Forster: not necessarily that of being gay, but of sharing understanding. As an example, Alan was delighted to find his ex-supervisor, now friend Philip Hall was also gay. This was the background to Alan describing what he found when visiting Cambridge, in a letter to Lyn Newman. 'A round of gaieties': defiance through humour was vital. In March 1953 Robin was just about to submit his Ph.D. thesis. Alan Turing wrote about arrangements for his viva. He got the Manchester computer to print it out, and then posted it — the nearest thing to an email in 1953. ... If you really are going skiing no doubt it could be delayed till April or May though I may have forgotten about it by then mostly. Turing never fully explained what had been involved in this 'crisis' about Kjell, the young Norwegian, but he told Robin later that 'for sheer incident' it rivalled the arrest and trial in 1952. Kjell had arrived at Newcastle from Norway. Police ('the poor sweeties' as Turing described them to Norman Routledge) were watching his house, and were deployed all over the North of England to intercept him. His friends never appreciated that there was something very serious going on: it was impossible for them to see Alan Turing as the repository of the greatest Anglo-American secrets. Robin's response was to recommend the novels of Denton Welch. Alan wrote to Robin, 23 November 1952: Have decided to have another, and rather more co-operative go at a psychiatrist. If he can put me into a more resigned frame of mind it would be something. This was nothing to do with the hormone treatment. It was Jungian analysis with a Dr Franz Greenbaum, a pre-war refugee from Germany. In the course of 1953 he became very enthusiastic about this experience, and wrote down all his dreams. Nothing survives in the way of notes, and there is no knowing what Alan Turing perceived as the psychological problem of his existence. As a Jungian, Franz Greenbaum did not see homosexuality as a condition to be cured. But possibly Alan felt that he ought, like Robin, to find within himself some potential for bisexuality. If so, this was probably not a helpful development. He reported 'becoming slightly hetero' as a 'fearfully dull' prospect, in notable contrast to his unfeigned reaction to the boys of Sherborne School. He mixed socially with the Greenbaum family, to a remarkable degree. The 2011 television film Codebreaker features an interview with Franz Greenbaum's daughters Barbara and Maria, who also speak on a BBC radio feature of 2014. There was an unseen world he could not have talked about. His problematic relationship with the state was not something that a psychoanalyst could resolve. Unable to travel to the future to where he belonged, only travel abroad offered the chance of freedom. He remained very interested in learning Danish and Norwegian, but in 1953 went in a sunnier direction. In summer 1953 he took a holiday in the new Club Med resort on Corfu. This would have meant a long train journey, probably stopping in Paris and Athens. He came back with a long list of men he had met. Young, free and single, in the growing economic prosperity of 1953? Not so free. 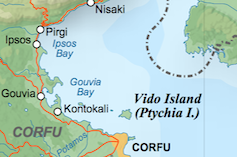 Corfu was on the edge of the NATO world, with Albania across the bay. The years 1953 and 1954 marked a period of panic in the Cold War. The first British atomic bomb (thanks to the Manchester computer) was successfully tested in October 1952. The first Soviet H-bomb was tested in August 1953; the 14-megaton American H-bomb was detonated in March 1954. That parallel figure Robert Oppenheimer was effectively on trial. He teased Robin for being a 'heretic' with 'allegiances,' who should be prevented from going on holiday abroad. Robin had, indeed, been a keen Communist party member, and back in 1940 had tried to convince Alan of the party line. This reference to the current McCarthy-era hearings in the US was not really a laughing matter. Robin had known Guy Burgess and Donald Maclean, who had defected to the Soviet Union in 1951. Documents released in 2014 show that Eric Hobsbawm, another King's don and close friend of Robin's, was under surveillance. Nor was Robin his only point of contact with Soviet influence. Fervent Communist Alister Watson had introduced Alan Turing to Wittgenstein in 1937. In 1953 the British and American authorities had no idea who could be trusted and left-wingers Dirac, Blackett — even the most respectable of Alan Turing's associates — were regarded as suspicious characters. How could any security official know what Alan Turing was thinking, or who he might meet in the dark alleys of European cities, or what other crazy thing he might do next? 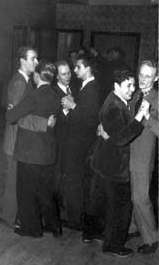 But regardless of these political associations, to be gay in 1953 was in itself to be regarded as a serious security risk. He asked Nick Furbank to be his executor, and made his Will in February 1954. It was an extraordinary document. Apart from small legacies to his brother, his nieces, and his cleaner, he divided his estate between the five people who had been most supportive to him as a gay man: Nick Furbank, Robin Gandy, David Champernowne, his boyfriend Neville Johnson, and his mother. In 1953-54 Alan Turing was as busy ever with morphogenesis, for example with studying a three-dimensional model of Haeckel's Radiolaria described by Bernard Richards here but that was not all. There was work on analytic number theory and engineering (joint work with a graduate student, R. K. Livesey). Most strikingly, he gave much time to fundamental physics. Alan Turing described to Robin the problem he saw in the foundations of quantum mechanics: when does the non-linear process of 'reduction' take place? He identified what is now called the Quantum Zeno effect. The influence of Dirac can be seen in these notes on spinors and tensors. In March 1954 Alan Turing sent Robin four 'Messages from the Unseen World' on postcards. The reference to 'the unseen world' was a shared joke with Robin about the religious standpoint of the mathematical physicist and astronomer Arthur Eddington, whose book The Nature of the Physical World had started Alan Turing thinking about fundamental physical theory in 1930. Eddington had published his lecture Science and the Unseen World in 1929. Play out God's holy pantomime. It was parody of the hymns of Sherborne School chapel, the sort of mocking-religion joke he would share with Robin and Nick. Yet it was perhaps also a serious return to his first wonderings about mind and matter. It was also seriously forward-looking: mathematical developments in relativity theory, just starting in 1954, would make the geometry of light rays the most fundamental structure. He also wrote to Robin: I'm trying to invent a new Quantum Mechanics but it won't really work. Robin's later memoir of this work for Newman described this and also commented further on the 'Hyperboloids' verse. His last postcard ended with a final joke about the Heisenberg Exclusion Principle, laid down for the benefit of the electrons themselves, who might be corrupted (and become dragons or demons) if allowed to associate too freely. A year earlier, Alan had joked to Robin about how 'heretics' should be banned from holidays abroad. This is the same theme, again hinted at cryptically. Alan Turing's crime had been one of associating too freely. He had no holiday in summer 1954. It is very likely that this would have been too much for the unseen world of British intelligence to allow. A security crisis of 1954, something of which he could not speak to his friends except in such cryptic hints, may well have been the last straw. On Friday 4 June 1954 he was at work on the Manchester computer as usual. 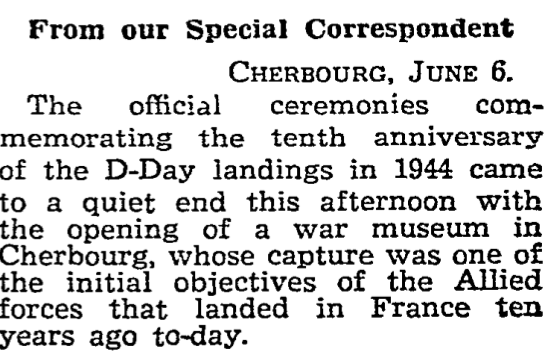 Next day was Monday, 7 June 1954. He took in the Manchester Guardian and threw it away. It was an utterly miserable Whitsun Bank Holiday. 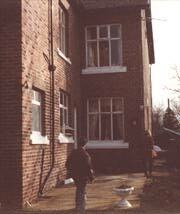 Alan Turing's house (my 1992 photo) He took his own life that day. The post-mortem described the cyanide in his stomach, bloodstream, brain. Less than a gram of potassium cyanide would have been fatal, and could well have been impregnated in the apple. 'Dipping the apple in the brew' seems to have been his plan, formed in 1937. The plan was that anyone could believe, if they wished, that he had been playing with a chemical experiment and had accidentally transferred cyanide to the apple, before eating it in bed. The plan worked. His mother believed it. So do other people. Maybe you do. He had set up an 'electrical lab' in that March 1953 of the Kjell crisis, and used potassium cyanide for gold plating by electrolysis. In the next door room, the potassium cyanide was being used in a similar experiment, with current still running. Everyone asked, why now? In 1952, with the arrest and trial, they said, it would have been understandable. Even his mother said that. But why, two years later? An answer: his sexuality didn't go away. State security didn't go away. They were incompatible and further crises were bound to happen. He was gone in a flash. Tuesday morning: Found dead by his cleaner. Thursday: Inquest: the verdict was suicide. Saturday: Cremation at Woking Crematorium. His friends never liked to speak much about it, and it remained a burden on them for ever. Nick Furbank, though a major writer and biographer, said little but that: I was bitterly distressed, as all his friends were, by his tragic death — also angry at the judicial system which helped to lead to it. According to Apple Inc., whose name was chosen in 1976, the logo was designed in 1977 to allude to Newton but also to 'the symbol of lust and knowledge, the colors of the rainbow in the wrong order.. hope and anarchy.' See this full discussion, and the designer's account. It was not some tribute to Alan Turing. In 1977 his story was very little known. Even if it had been known, suicide would hardly have been a happy start-up icon for the young Apple company. And yet, it's one of those many extraordinary things which make Alan Turing's life resonate far beyond his death.